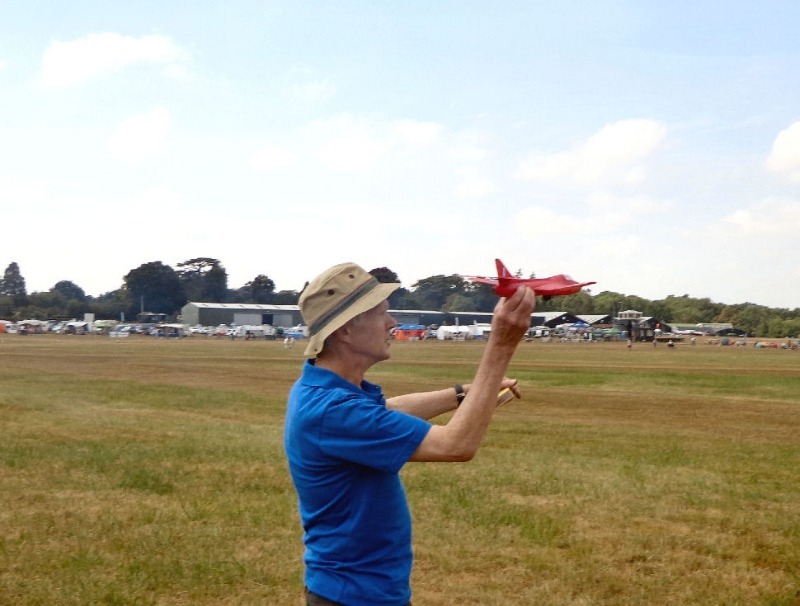 The weather was hot with a light breeze, ideal, at last some decent flying medium. Well, remember what floats our boats for a minute, rockets yes? Consider the tinder-dry grass we'd be flying on. 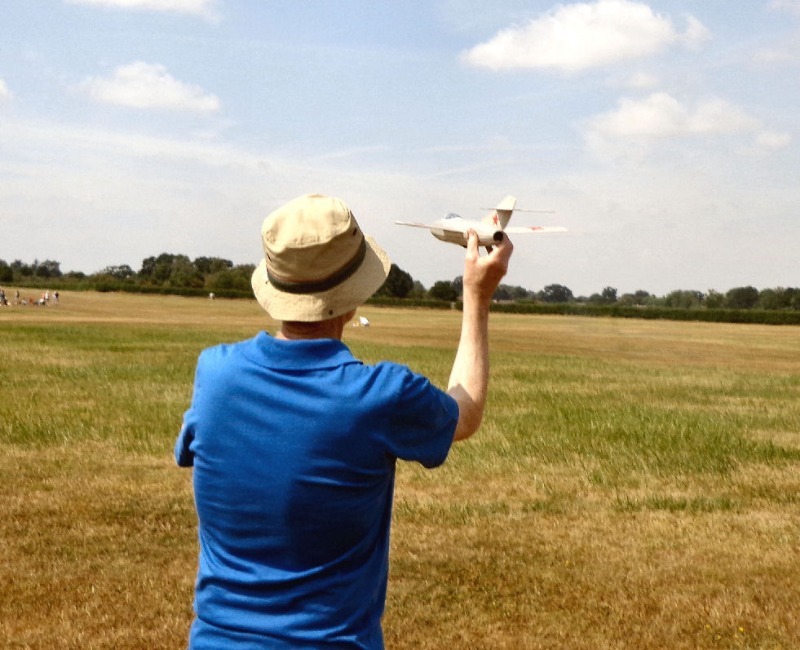 Saturday saw me taking two models, a rubber KK Elf and a minium tiny r/c. You guessed it, I chickened out on the Rapier front but to my joy others didn't and got away with it..without a bushfire. 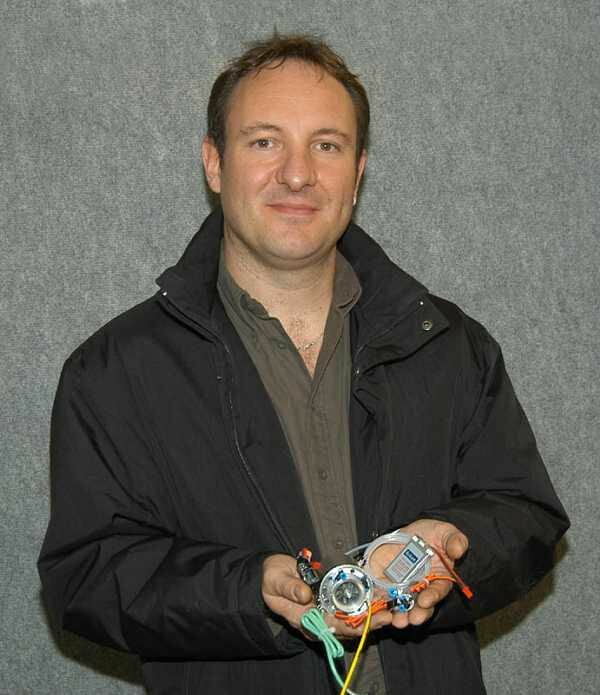 Above: John with his KK Hunter. .... and so to launch for a great flight! The rocketeers took shelter from the sun in the tree line, Roger, Chris, myself and the pair of Johns were joined by German engineer Martin Lambert..
No Dr Z due to car problems, so no new motors, drat. However, although there wasn't a big turnout on saturday, it was fun, particularly a full size Spitfire less than a mile away appearing 3 times??? Our guest from Germany opened a small field case revealing a fist size 'Kolibri ' gas turbine engine, fuel, start gas,ccu all enclosed. It took him all of a minute to have it shreeking to over 300,000 revs. Needless to say I was tickled pink. 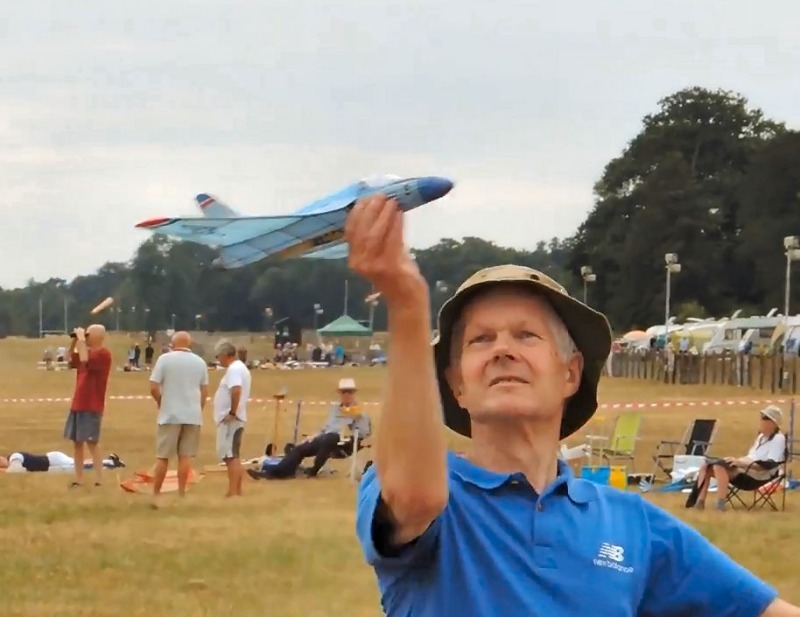 He also had some jetex models, a lovely large deisel Fokker Eindecker with carbs made by himself...unreal man. I got a quick look at a jetex 35 type motor he'd made from stainless steel but very thin case and light weight. Many had dreamed of this, he's done it. Couple this with excellent spoken English, for my money he has gonads big enough for a dump truck...and it was the first time he'd driven on the left side of the road!!! Sunday, alas no Roger but a much bigger turn out. More overcast but still hot with the breeze. John and Mark Digby, Dr John Emmett arrived and I'd packed the Rapiers this time. 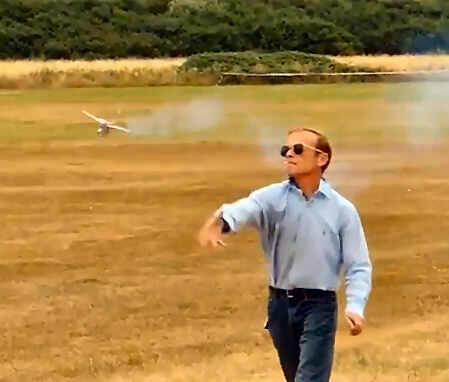 No fires yet again, but quite a few rapier flights which Mark has recorded. The day went much too fast and was over before you could blink. Hot but good for the soul. Looking forward to some photo's or dare I push my luck... videos? 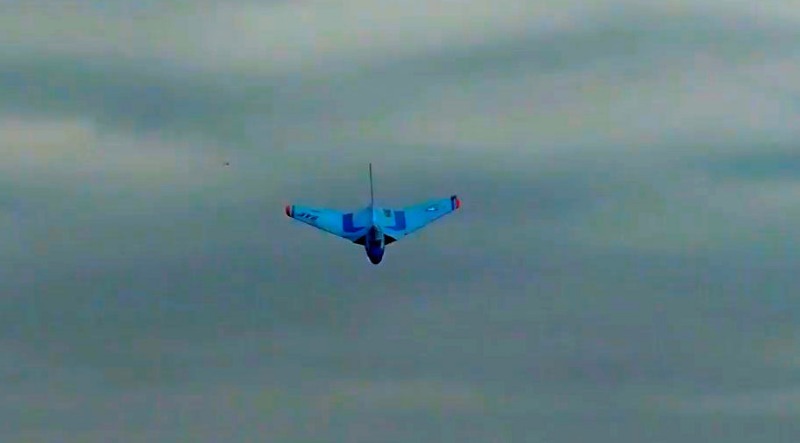 But I did enjoy Saturday - I 'helped' John Holman fly his Hunter, Panther and MiG 15, all with genuine Jetex 50 motors. Wow! 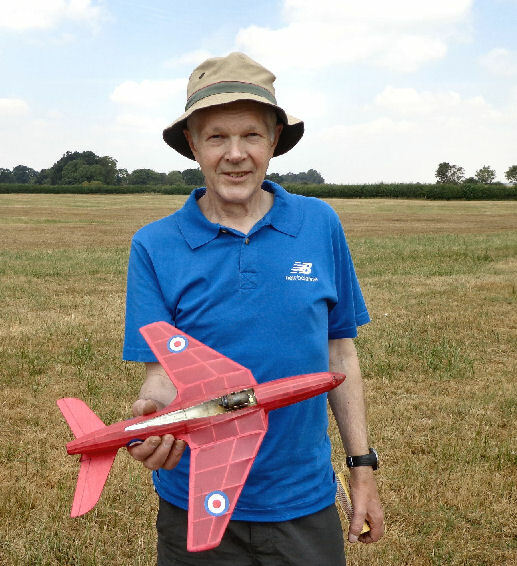 Andy got John Woodham's just finished T-38 in the air, and John's Wren made a number of eccellent flights, as did Chris Richards (a lovely flight) and Martin's Wren (another lovely flight) which chuffed him immensely! 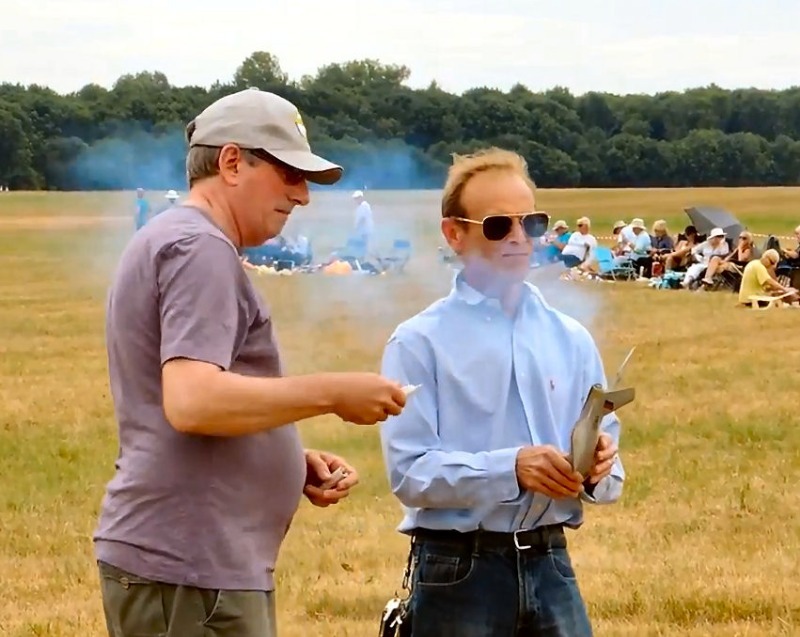 I think Martins hooked and I hope to wean him away from RC and nasty turbojets! 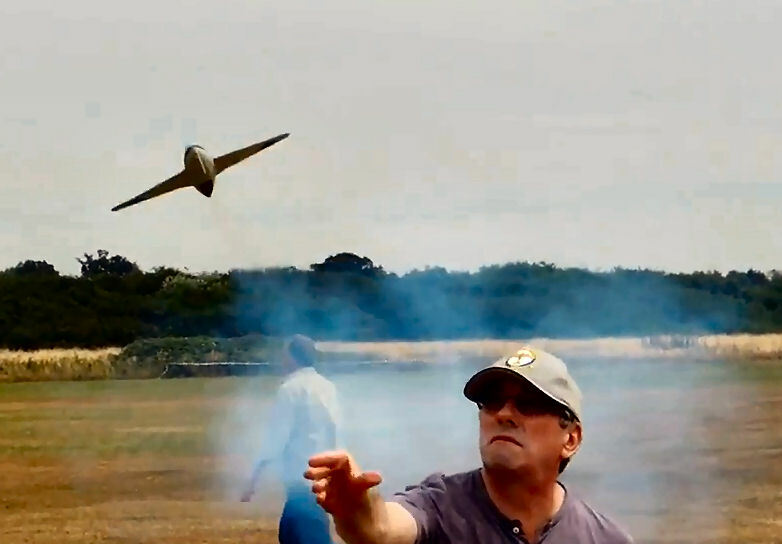 I flew my Veron Quicky Panther with Jetex 50 motors, and thrillingly, a nicely engineered Japanese Tiger A motor. So I went home happy but not sure about my heart! Video showing Sundays exploits. A little different this time in that a few electric ducted fan models have been included. Many thanks to Mark and John for putting this video together. 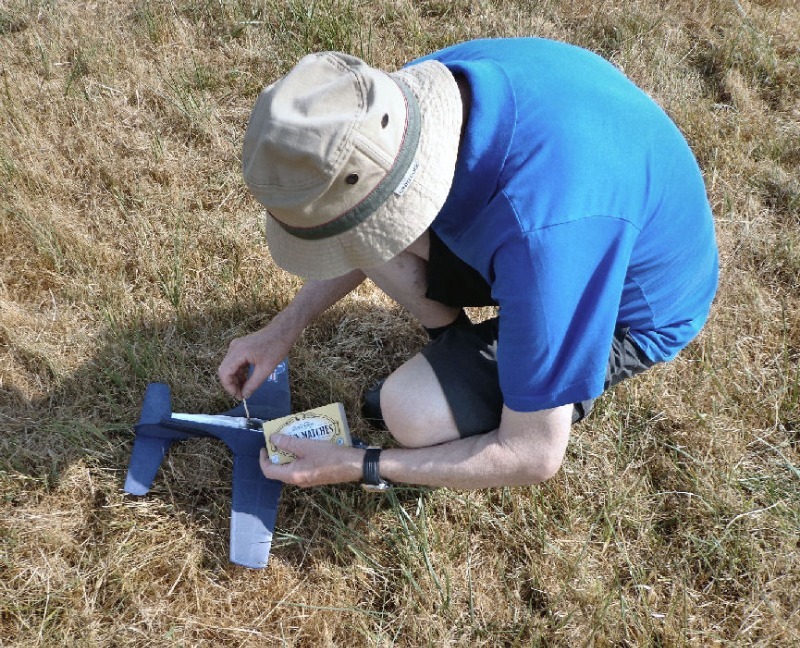 It looks like you had a good day on Sunday, with many splendid flights in what appear to be quite tricky conditions - the wind appears to come from different directions and of variable strength. The estimable John Emmet, like me was pretty impressed. 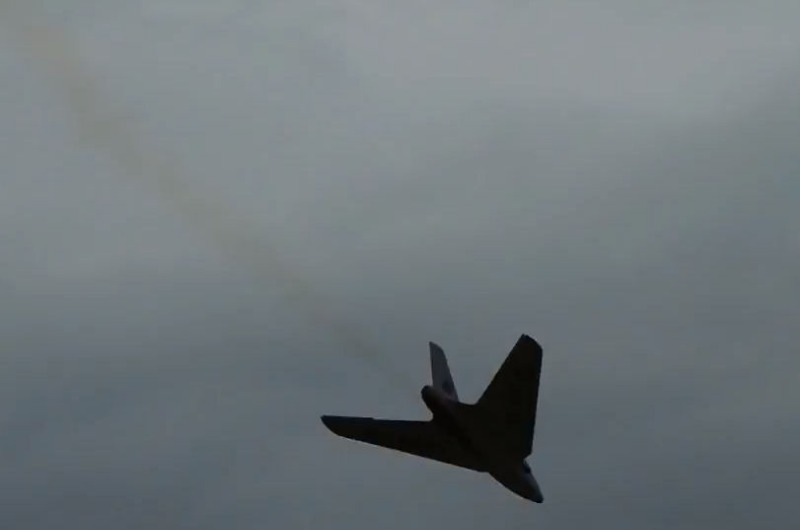 John commenting, "The guys are too modest by half - their flying was just so skilled. The wind was quite tricky (warm winds always seem so light), and the ground was so unforgiving". I can only agree and wish I had been there to witness the fun. 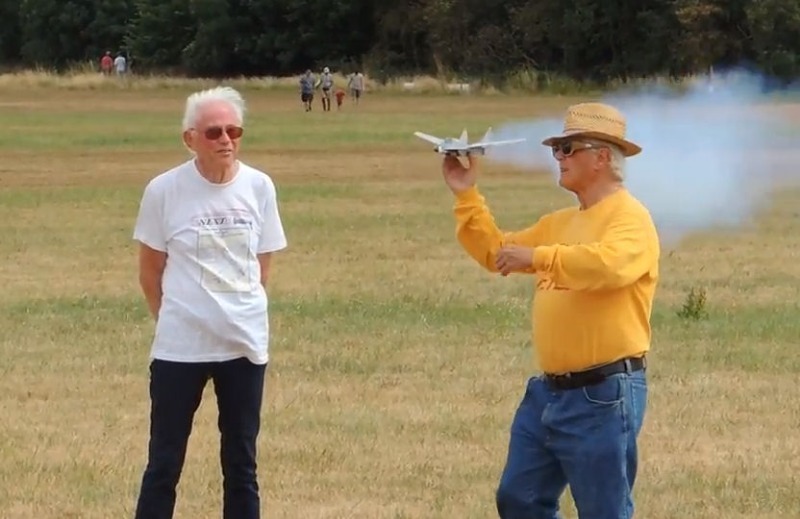 Above: the estimable Chris Richards and John with Chris's impressive MiG 29. I hope more guys will be inspired to fly 'genuine Jetex'! 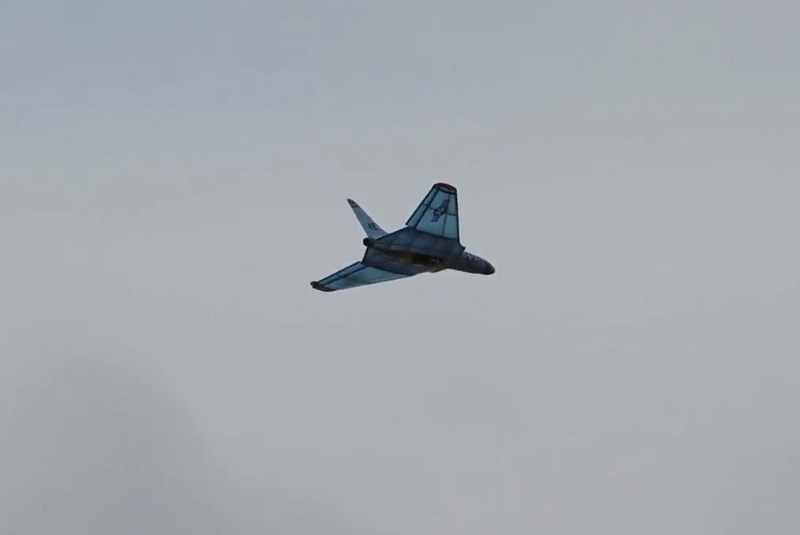 There are (I think) two EDF models in the video: a large modern jet made (I think) by Ivan Taylor and Derek Knight's small MiG 15. The latter put in the best flight I have ever seen with a 'Jetex 50' sized model. Derek seems to have cracked the 'micro EDF' fan/motor problem at last (unless he was just lucky and the model caught a thermal. but I don't think so). Have any of you guys who were there got any details of these outstanding models?